This summer, we invite all members of our community to get to know our wonderful education team. 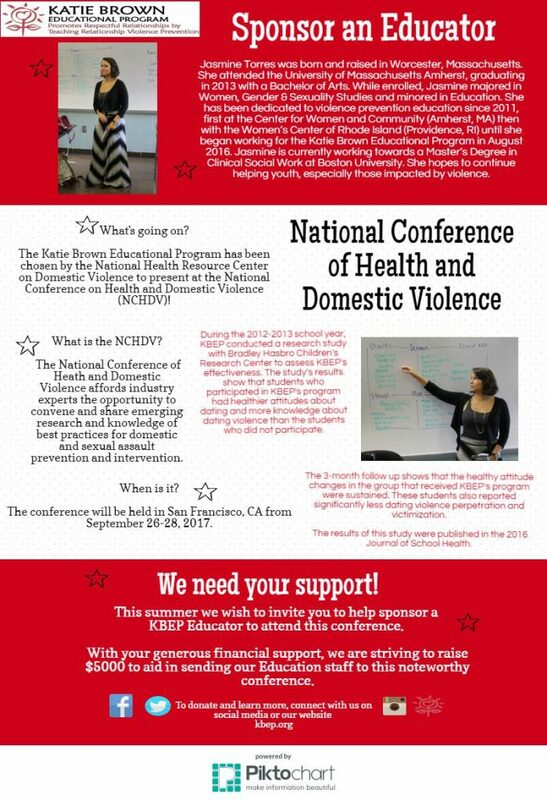 We hope that as you learn more about the people who work towards preventing relationship violence and the National Conference of Health and Domestic Violence, you will feel compelled to help our education staff participate. Jasmine has been with the KBEP team since August 2016 and as you will learn, she has a background that is rich in advocacy. After reading her bio and more about the conference, please click anywhere on the graphic below to be directed to our donation page. Additionally, you can learn more about the conference and Futures Without Violence by clicking here.